Recently I posted a design for a T-Shirt on Teespring.com. The shirt sold and it has funded me to move forward with my TV program 'Blindside Fresno'. The program pilot is still in post production, my editor ois working on the final portions of the titles and credits and so fingers crossed I am looking at possibly having the prograam aired sometime in May. Here is a picture of me in the T-Shirt which I designed. 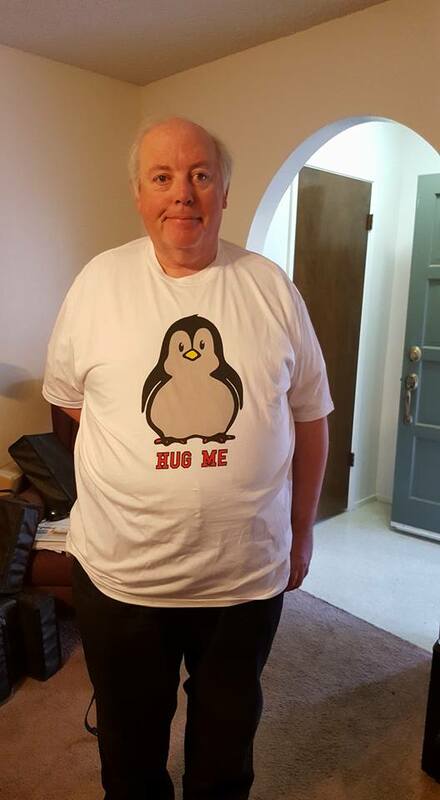 The shirt is not guaranteed to get you more hugs, but it is still available from TeeSpring Hug Me Penguin T-Shirt but proceeds from your purchase will help me create new programs in the series, 'Blindside Fresno'.